Projectors have been a part of the business world for many years and even to some extent, they worked their way into the home theater industry. Now, with the introduction of the short throw projector and also the ultra-short throw projector that makes it possible to display larger images in tighter spaces. These projectors can be placed on a table as close as 15″ away from the wall and still be able to project a massive image on the screen. As part of our research for this article, we searched online for as many examples of the short throw projectors and came up with our list of the best projectors. We found a number of portable models, table top and there is even a best short throw projector 1080p model. Along with the list of the projectors, we have included reviews to help the reader make a more informed decision when it is time to buy one for themselves. The ultra-compact ML750ST LED Projector is packed with all of the latest technology in video projection. This carry anywhere powerhouse will be a game changer for the sales industry. No more need for using bulky and clunky equipment that is impossible to rely on and replace it with this amazingly compact and portable LED Projector. 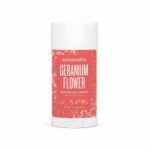 It virtually fits in the palm of your hand and only weighs a pound. It features an extremely bright 700 Lumen LED lamp that is able to project a beautiful HD picture up to 14 feet away. It is capable of showing a crisp, HD picture up to 60″ as close as only 3 feet away. At its maximum distance of 14 feet, it is capable of projecting an image as large as 199.9″ (16.5 feet) without losing a bit of its clarity. Thanks to some major innovations that are built in, you do have to even have it connected to a computer to be able to run. The built-in SD card reader and Office Viewer, you can project your important presentations directly from the SD card. Also using HDMI/MHL you can mimic your Android or iOS smartphone right to the ML750ST. The Optoma ML750ST would be the perfect addition to your new home entertainment system. Imagine watching your favorite sports or movies on a huge 100″ screen without having to leave your home. The PF1000U Ultra Short Throw Projector from LG is one of the best home entertainment projectors on our list. Wireless connectivity and built-in Smart TV functions mean you can stream your favorite online content directly to it and project a picture that is 1080p and up to 100″ at a distance of only 15″ away. The ultra bright 1000 lumens makes it possible to project such a large screen without it having to be all the way across the room. 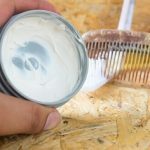 It features a number of other technologies that allows connecting directly to any smartphone running Android OS and Windows (not compatible with iOS devices) and stream content directly from your phone. The Smart TV functions mean you can use your Netflix and Hulu accounts and wireless streaming to watch all your favorite shows directly to your project without needing any wires. You can even use an existing Bluetooth soundbar system to deliver HD quality sound to go along with your HD quality video that will take your home theater experience to a whole new level. The multifunction remote that comes with it can be used to control the entire operation for one single device. 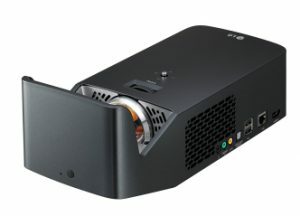 The LG Electronics PF1000U is one of the highest rated of the all the projectors on our list. It produces an amazing picture quality and sound. It would be the perfect touch to your living room entertainment system and watch your favorite TV on a huge 100″ screen. The PJD5553LWS from ViewSonic is a powerful home entertainment projector. The ultra bright 3200 lumens is capable of projecting a 55″ image as close as 2 feet away and an amazing 230″ image at just 8 feet away. The proprietary SuperColor technology from ViewSonic recreates near-to-life color performance at every screen size. 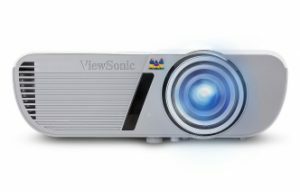 ViewSonic designed this projector to be well-suited for use inside the home, for educational settings and also for small business environments. The ultra bright 3200 lumens LED lamp and Viewsonic proprietary short throw lens and technology allows it to project larger images inside a smaller room. Thanks to ViewSonic Dynamic Eco technology the life expectancy of the LED lamp can be extended by an additional 10,000 hours and reduces power consumption by up to 70%. With a number of connection options like dual VGA and HDMI inputs, you can use it as your home entertainment system. 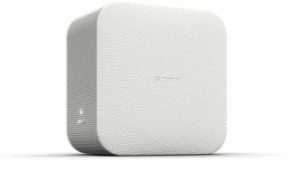 It even has a built-in amplifier and 2W speaker and it can be connected to any home sound system. It also can be used in conjunction with a Blu-ray players, Apple TV, Amazon FireTV and Google’s ChromeCast. The included the remote control with batteries makes setting up and operating it simple. The ViewSonic PJD5553LWS is one of the most powerful of the short throw projectors on our list. It delivers consistently great images from 55″ all the way up to an amazing 230″. The GT1080 1080p Gaming Projector from Optoma is a true home entertainment projector with multiple ways to connect and use it to project large screen images in your home. It gives you a home theater room feel in your living room. 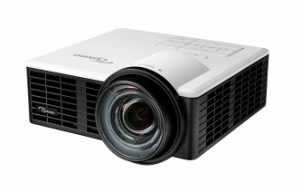 No need to create a separate theater room with the GT1080, it is capable of projecting a 100″ image with it only 4-feet away or even 166″ at 6-feet away. The high resolution, 1080p images and ultra bright 2800 lumens delivers amazing images at 100″. The HD 1080p resolution is perfectly suited for playing games and watching sporting events on TV. The multiple ways to connect directly to the GT1080 makes it extremely versatile and the right choice for your home entertainment system. It features Texas Instruments DLP color technology that delivers true-to-life color performance. The DLP processor chip supports high speed 16 microsecond response time and 144MHz refresh rates, the combination is designed to deliver flicker-free on-screen action. The DLP technology also features an extremely high contrast ratio, deeper blacks and crisper whites that really brings out the best in the color reproduction. The Optoma GT1080 is the perfect companion for the gamer that really wants to bring their gaming experience to a whole new level. You can either connect your game console directly to the projector via HDMI or connect your Android or iOS smartphone. This would a great choice for gamers and non-gamers alike to add to their home entertainment system. The ultra-compact, ASUS Si 200 is a high-quality pocket projector that you can take virtually anywhere. The 200 lumen LED lamp is capable of projecting a 41″ image at only 3-feet from the screen and up to a maximum of 100″. It features multiple communication ports plus WiFi and Bluetooth technologies make it extremely versatile. The Texas Instruments DLP color technology helps it to deliver crisp, high-quality color images. The bright 200 lumens LED lamp features a 30,000-hour lifespan, which will provide many years of usage before it would need to be replaced. It delivers high-quality sound reproduction thanks to the ASUS Sonic Master technology enhanced built-in speaker system. Connect directly to it via the HDMI port or MHL port with included cable or an optional cable sold by the manufacturer of your smartphone or tablet. The rechargeable 6000 mAh Lithium-ion battery provides up to 3 hours of projection time and also can be used to recharge your other mobile devices in a pinch. The ASUS Si 200 Lumen Short Throw Project is great little compact and portable LED projector. ASUS has put together a great little package that lives up to the ASUS name. It is a capable little project for those who are on a budget and who are still wanting to get the advantage of a short throw projector. 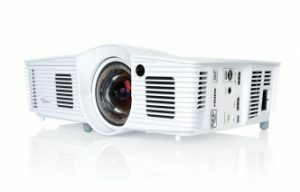 The LSPX-P1 is one of the most unique of all of the short throw projectors on our list in that it uses a special laser technology to project images from 22″ up to 80″. It can project an image directly on the wall, the table or even the floor in front of it. It also comes with a wireless HDMI adapter unit which means you can connect just about any device that uses HDMI connection and then wirelessly connect to the projector. It features high-quality 720p HD resolution for crisper images at up to 80″ from the exclusive SXRD laser panel. The built-in rechargeable battery delivers up to 2 hours of projection time and the quick charging only takes 4 hours using the included charging cable. Using the Bluetooth and your smartphone you can control all of the functions and stream online content directly to the LSPX-P1. The sound reproduction is unequaled thanks to the dual bass reflex speakers and built-in amplifier circuitry. You will be able to enjoy the HD sound along with the 720p HD video of your favorite music, movies, and sporting events. 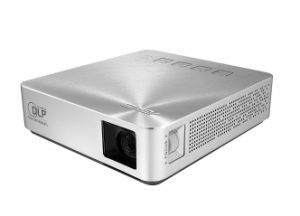 The LSPX-P1 Ultra Short Throw Projector is a highly technologically advanced projector that is packed full of features and capabilities. This ultra-compact projector can be virtually carried and used anywhere. 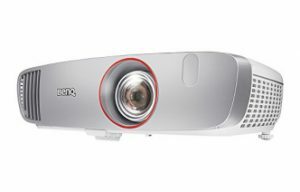 This projector would be perfect for a number of purposes including an outside salesperson or an even educational environment. The HT2150ST 1080p from BenQ is a high quality 1080p HD projector designed for home entertainment systems. The ultra bright 2200 lumen LED lamp is capable of projecting images up to 300″ and 100″ at just 1.5 meters from the wall. It is perfectly suited for gaming as it has amazing response times and ultra quick refresh rates using the Texas Instruments DLP technology. The full 1080p HD with a native 1920×1080 resolution combined with the DLP color system which features 6x RGBRGB color wheel which reproduces colors like no other system. The 15,000:1 contrast ratio also helps to produce crisper colors thanks to the whiter whites and deeper blacks. BenQ combines this HD video with the highest quality audio featuring dual 10-watt stereo speakers built in and is bolstered by their exclusive Cinema Master Audio+ technology. The HT2150ST features multiple ways to connect to it including 2 HDMI ports, MHL port for connecting iOS and Android enable smartphones and tablets directly using a special cable. The HDMI input can be used in a number of ways including hooking it up to Blu-ray, gaming consoles or PC. The HT2150ST 1080p from BenQ is one of the best home entertainment system on the market and on our list. The full 1080p HD quality images and is capable of projecting up to 300″ images. This is would make a fantastic choice for anyone who is looking for a high quality, HD projector.